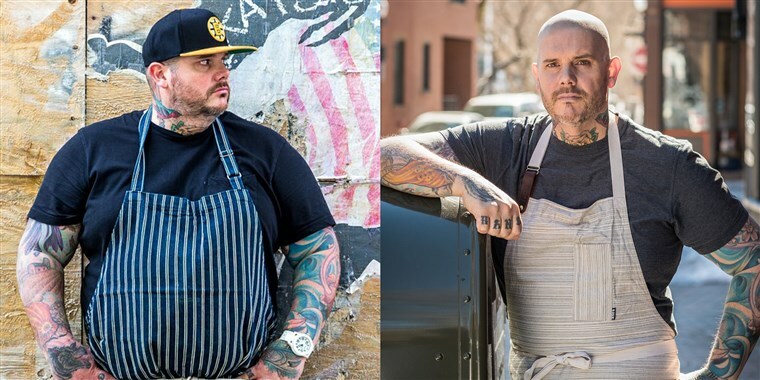 He’s a New England chef, a dad, a cookbook author, and he’s married to a pastry chef; so how did Chef Matt Jennings go from working 17 hour days in one of Boston’s hottest restaurants to losing 200 pounds and keeping it off? Tune in to “My New England Kitchen” podcast and find out! On today’s show, my interview with New England Chef Matt explores his incredible journey from fat to fit, how a healthy diet and daily exercise have helped him keep the weight off and feel great, his stunning breakout cookbook, Homegrown: Cooking From My New England Roots, Matt’s favorite ways to add flavor to nourishing meals, how to create a killer cheese plate, Matt’s newest tattoo, and two recipes: a lamb meatball recipe with yogurt sauce that’s to die for and a recipe for little gem salad with cheddar vinaigrette and pistachio granola. By the way, Matt’s granola is THE BEST homemade granola I’ve ever made. Here’s a photo of Matt before he lost the weight and an after photo of Matt, 200 pounds lighter. 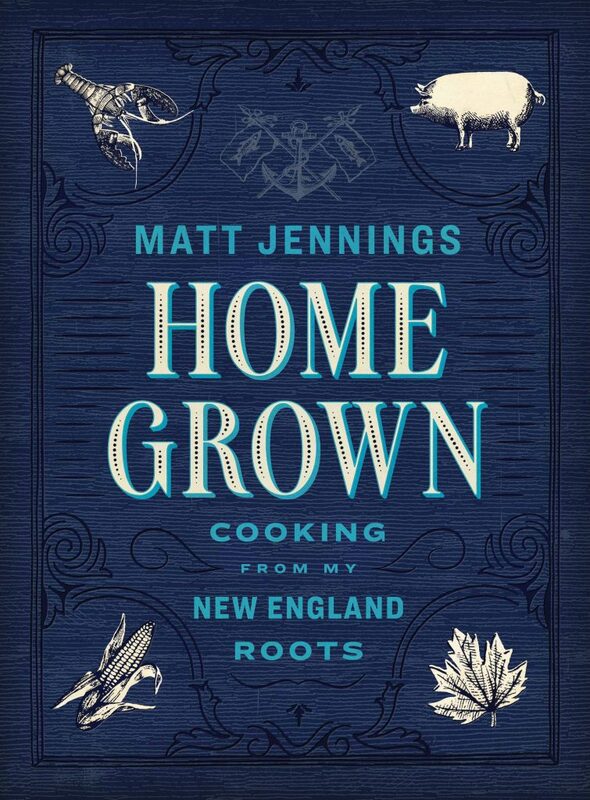 We’re giving away a copy of Homegrown: Cooking From My New England Roots (U.S. only, please.) To enter, post a comment at the end of this post telling us why you want to win the book and/or your favorite New England food memory or meal. (My favorite memory takes me back to college when I tried fried clam cakes for the very first time at Narraganset Beach in Rhode Island.) And if you’ve gone through your own weight loss journey, please tell us about it. Giveaway ends February 13th, 2019. 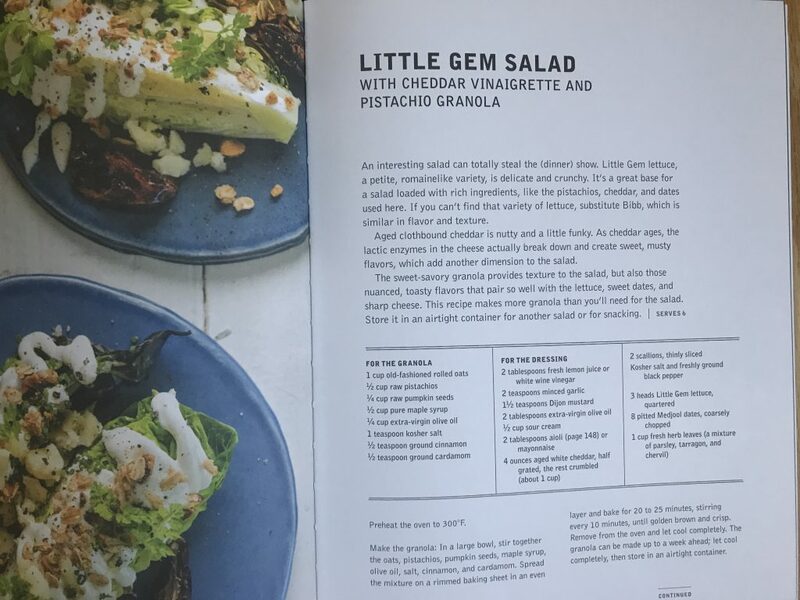 Little Gem Salad with the best homemade granola on the planet! Matt’s journey: how he started cooking at age 14, attended culinary school in Vermont, worked in restaurants all over the world, and owned and operated and two of his own restaurants. Matt’s two sons, ages 9 and 5, who are growing up as “restaurant brats” and just beginning to dabble in the world of cooking. How Matt shifted priorities from his 17-hour days at the restaurant and recommitted to living a healthier life. With healthy food choices and daily physical activity, Matt has keep the weight off. Matt’s gastric sleeve surgery and his new-found addiction to the gym. Matt’s ideal healthy lunch: greens cooked with olive oil, a protein like grilled chicken or steamed fish, and some cooked grains on the side (barley, quinoa, or wheat berries). The key to flavor: sauces and spices (keep them on hand and experiment). Matt’s 30 day no-refined-sugar challenge … all while being married to a pastry chef. How Matt and his wife met when she was the baker and catering manager at a restaurant in Cambridge, MA and he was the cheese buyer. 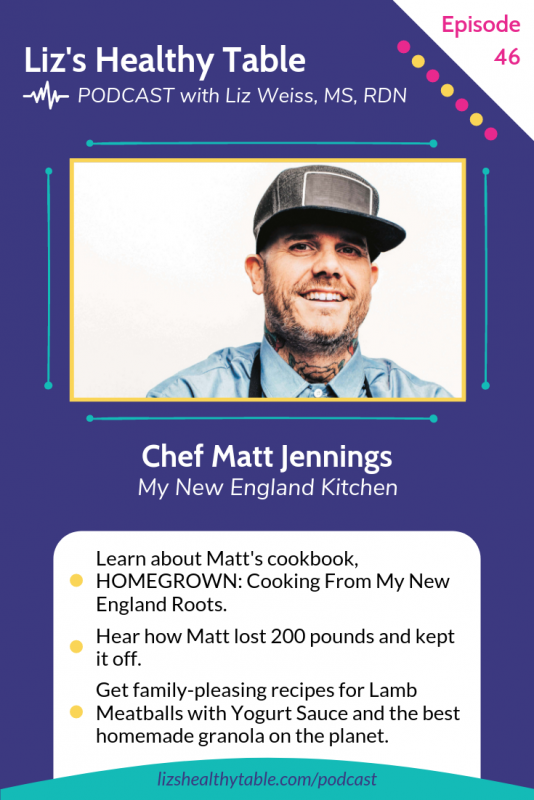 Matt explains how being a chef in New England defined his life and how it drove him to write Homegrown. The influence of Nantucket and seafood on Matt early culinary life. Some of Matt’s favorite recipes from Homegrown: his mother’s chowder, his chowder, meatloaf, and lime marinated grilled chicken. Matt’s little gem salad with cheddar vinaigrette and pistachio granola. The best granola on the plant (from Homegrown), made with old-fashioned oats, pistachios, pumpkin seeds, maple syrup, olive oil, salt, cinnamon, and cardamom. Matt’s lamb meatballs made with ground lamb, egg, bread crumbs, shallots, salt, cumin, black pepper, and harissa, along with the yogurt sauce of garlic, mint, and dill. How Matt encourages his kids to be adventurous eaters. What’s next for Matt as a consultant: Growing Full Heart Hospitality, which is a full-service food, beverage, and hospitality consultancy. Matt’s rules for the perfect cheese plate: Buy from the right place, store the cheese properly, and serve at room temperature with the right condiments. Why Matt’s tattoos are a collection of stories. I’d like to win so I can make some family friendly recipes. Thanks, Liz! Another good episode! I’d love to win Matt’s book, and I wish I had a New England food memory. We’ll have to go there sometime. I’ve always lived in the Midwest. I’ve only been to the East Coast twice, and I’ve never had a chance to spend time in New England. My deep family roots go back there, though. My paternal grandmother’s family can trace her English ancestors to the Mayflower, and I’m guessing that her English plum pudding recipe might have some connection to that branch of our family. Also, I enjoyed hearing about Matt’s weight loss journey. I’ve lost nearly 200 pounds, too, though not all at one time, but from my heaviest weight in 1997 until now, I’m 190 pounds lighter. I’ve gone up and down a bit over the years, but I’ve never been as heavy as I was, and I’m now lighter than I’ve ever been since I was a child. I’m finally at a weight that my doctor says is right for me. I’m working hard to keep the weight off now, by the grace and mercy of God! I exercise nearly every day, and I record everything that I eat on the app for My Fitness Pal. Podcasts like yours, Liz, help keep me motivated and focused. Thank you! I would love to win a copy of the book as all of my roots are Southern for generations. I enjoy cooking and experiencing recipes from everywhere. Thank you for the opportunity! I’m a southern girl, but love a New England lobster roll! 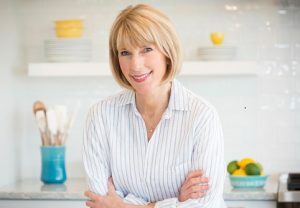 I don’t know much about New England food except for seafood, so I would love to get this cookbook to expand my horizons! I would love to win this cookbook! I live in New Jersey now but I was born and raised in Connecticut. I also lived in Vermont for 3 years so I will always be a New Englander! I would really enjoy making some Chef Matt’s recipes! This cook book looks amazing!! I’d love to be able to recreate all of the wonderful recipes you guys talked about. I love the way Matt uses fresh ingredients in his dishes and creates them with his own twist. 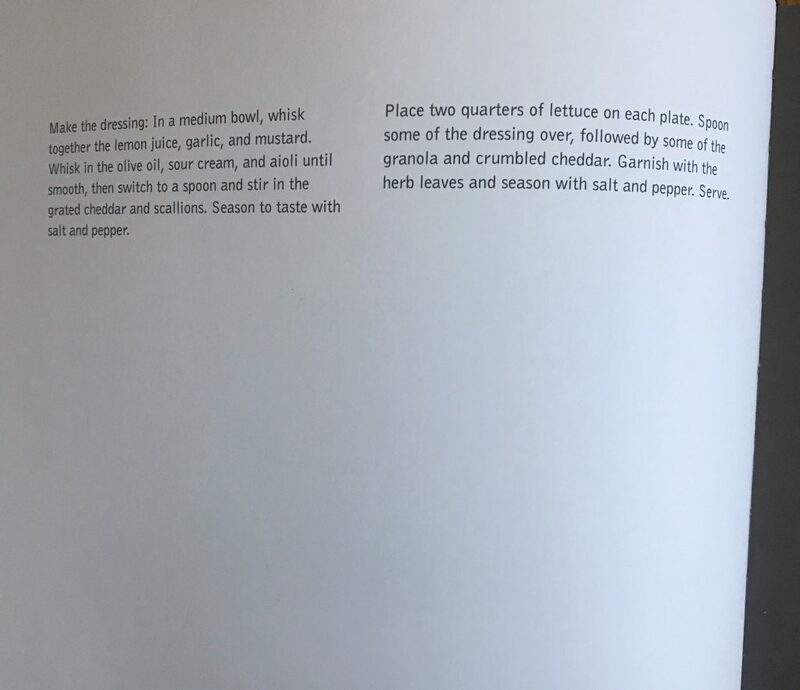 Also think it’s neat he includes his mother recipes as well. I also love to read cook books like a “book” so this seems to be right up my ally! His story is very inspirational in many ways as I also want to learn new cooing methods for Heath for me and my family. I would love to win this cookbook to try out some of his recipes. I do not have any New England recipe memories but would love to make some! I consider New Hampshire my home even though I only lived there for 16 years and now live in Arizona the past 15. I miss the green!!! Would love to win book because I have no experience of New England food! Lived in southern ca entire life, sheltered unknowingly from the new England’s food experience! It would be great to cook some healthy New England meals. I would love to win this cookbook because I like trying new recipes. I remember as a child my mom making what she called New England Boiled Dinner. Blueberry Muffins, Boston Cream Pie and Cider Donuts. Another great podcast! Very inspiring and informative as always. My favorite New England food memory is eating fresh lobster on the Maine coast. The memory of sun sparkling on deep blue water, fresh air and simply prepared fresh lobster is deeply ingrained in my memory. I would love to win this cookbook for the inspiration it would provide me and my family. Glad you liked the podcast. I’m with you on the lobster .. and Maine! I’d love to win so I can learn some New England recipes. I love trying new dishes! Seafood! Hook a girl up. I would love to know how to prepare something other than baked fish with bread crumbs sprinkled on top (lol), but seriously! 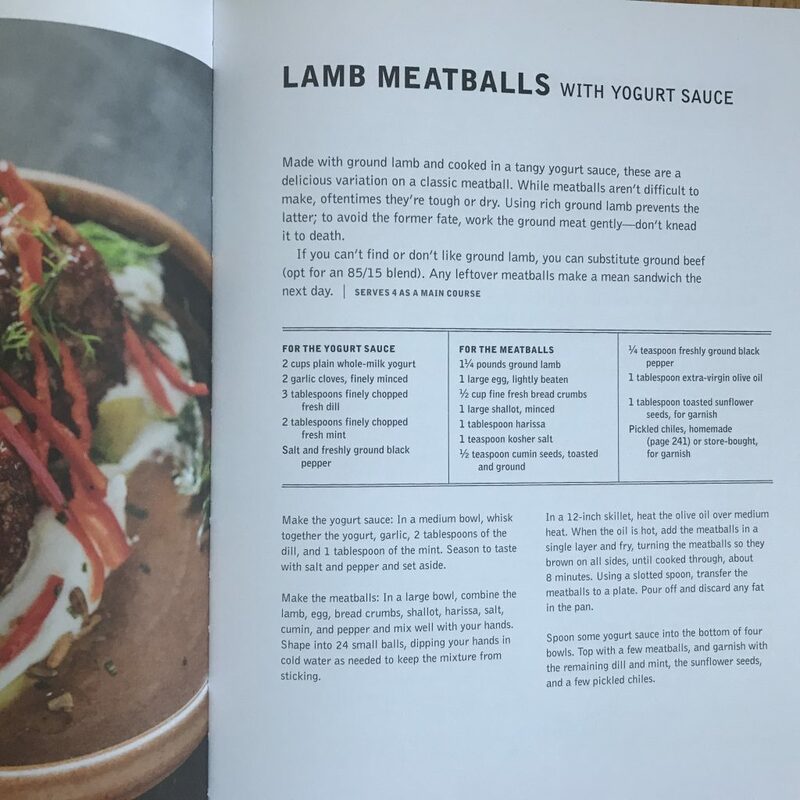 As a second generation American who has struggled with weight for as long as I can remember, I’d love to have Matt ‘s book to have healthy and delicious recipes. I’ve lost some weight but have more to lose. Having good recipes are one tool to sustaining the weight loss. Thanks for entering the giveaway, Sandra. And just as an FYI, some time in March or April, I plan on doing a podcast on losing weight .. and keeping it off. Dr. James Hill will be my guest, and I think you’ll love that episode!! My name is Liz too! I’m just a collage kid trying to improve my eating and cooking. Also I am going to marry my boyfriend soon and I want to help him loses little weight. Why not help him eat healthy delicious food! I would be so happy to learn from that cook book and become inspired to do more. Thank you so much for your podcast. I can go to my happy place when I listen to you. I’m going through my own weight loss currently! Can always use new recipes to help keep things from getting boreiing. This was an amazing podcast and a great opportunity to win this fabulous cookbook (thank you!). I’m a grass roots southern girl who is most familiar with regional recipes/dishes. I have a daughter who is a high performing athlete and I’m struggling to expand healthier recipes to help with her specific dietary requirements. This cookbook looks to be a perfect resource for this opportunity by providing not only healthy recipes, but inclusive of some non-traditional ingredients from our southern perspective!!! I also adore novel-ish cookbooks. I read all of my cookbooks like a novel (from cover to cover) before making the first dish! Love that style! Thanks for entering the giveaway! I’ve got Virginia Willis, author of Secrets of the Southern Table coming on the podcast soon. I know you’ll love that upcoming episode! Are there printable recipes for meatballs and salad? Loved the podcast. Hi Dan: Glad to hear you loved the episode! I always share recipes on my Show Notes. 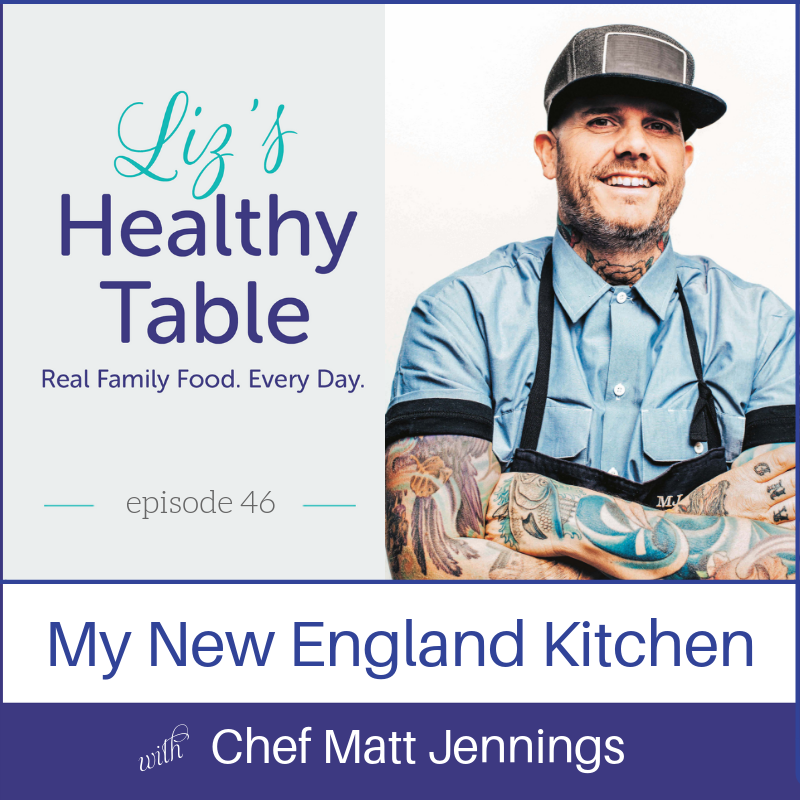 Here is a link: https://www.lizshealthytable.com/2019/01/29/lizs-healthy-table-podcast-my-new-england-kitchen-matt-jennings/ ENJOY! !